The Celtic Cross is a traditional tarot spread. I often use it with individuals who have general questions about what is happening in their life. I believe that there is an element of gaining extra time with the Celtic Cross, by this I mean that there is time to make changes if you do not like what is being said (as with any reading). There is information about your past, present, and the near future based on the energy you are putting into the world at this moment and how you feel about the situation in question. My favorite position in the spread, is the one that crowns the Significator, I will refer to this as the third card, it is a step that the questioner can choose to make or not, it is in the position of freewill. James had the 5 of Swords in the position of freewill. It was the only Sword in the spread. To give you some background, James had just returned from an adventure in Alaska that had been cut short, do to factors that were out of his control. I think James wanted some insight about the experience and possibly what he had to learn from this trip that did not develop in the way he originally anticipated. Getting back to the 5 of Swords. Words that come up when I think of the 5 of Swords are: tension, conflict, alienation, worry. Swords are about the mind, swords communicate using the mind and one’s mental faculties. I interpreted the 5 of Swords as tension in the mind. Often, this tension exists because of negative patterns of thinking, often as a result of one’s environment and how situations are interpreted. Worry or mental strain can be caused by other people in your environment that is internalize by the questioner. All of the other cards represented in the spread lead me to believe that James was worrying about things that were largely out of his control. It seemed that by returning to Portland, James was in the very place he needed to be (as interpreted in the spread). 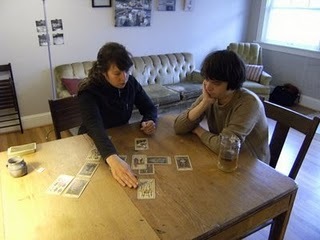 James had many cards known as the Major Arcana cards in his reading spread. The Major Arcana are examples of the very archetypes that exist in the world. James had four Major Arcana cards: the Fool, the Hanged Man, Temperance, and the Emperor. I interpreted the Fool as a seeker of adventure, The Hanged Man as the need to let go of what cannot be controlled, Temperance as the need to be balanced (internally as well as externally) and the Emperor as the need to put all your ducks in row and to create an orderly and productive work environment. The last card, in the position of end results was the Emperor (which mirrors the Significator James chose to represent himself). My final interpretation was: if James let go of preconceived ideas about what should happen, and put energy into creating an environment that was orderly, balanced, and structured, all would be right with his world and he wouldn’t have to worry (the 5 of Swords).